Every year our wine sense are guided by a delightful little book called Platter’s Wine Guide. It is a collection of most of the wines available in South Africa and they do the tough job of grading these wines as well to help you discern between the mediocre, great and amazing. For the past few years Platter’s Guide has included brandy in their reviews, not only introducing the South African wine consumer to brandy, but introducing some lesser known (and available) brandies to us. This year no less than 8 brandies were awarded the top marks of a Platter 5 Star award! A true distinction of quality, superior taste and value of the craft. We here at Brandy & Ginger however wanted to take it one step further… How do these 5 Star accolades compare to each other, hence the Platter’s 5 Star Brandy Shootout. This was a tremendous task to distinguish and separate such highly awarded and quality brandies from each other. We are aware that there is copious amounts of information to give through when comparatively tasting all these brandies against each other, so for ease of access we will start this review off with a summary of our findings followed by the more detailed tasting notes and scores. It is hard to compare the KWV 12 and the Van Ryn’s 12 seeing as they are two totally different brandies regardless of the same age! The KWV 12 scored better on this tasting and will always be a bargain at the current price tag, but don’t let my rating of the Van Ryn’s 12 deter you from this great brandy with complexity that rightfully comes with the price. It might be a bit pricey, but every drop is worth every penny. The three 20YO’s scored so very close and the Boplaas narrowly came out on top between the 20YO’s. All three of them are amazing in their own right at it is very difficult to hand out accolades. Each one of these brandies could have won on any given day, and all three undoubtedly deserves their 5 stars. The KWV 15 was stand out yet again! It has been some time since it was last tasted, but the recollections were confirmed and it was the definite favourite today. Considering the price of a bottle it is definitely 1st place material all the way. (Strong) Personal opinions aside, Platter has done an excellent job in handing out their stars and in no way can their ourtcomes be criticized. 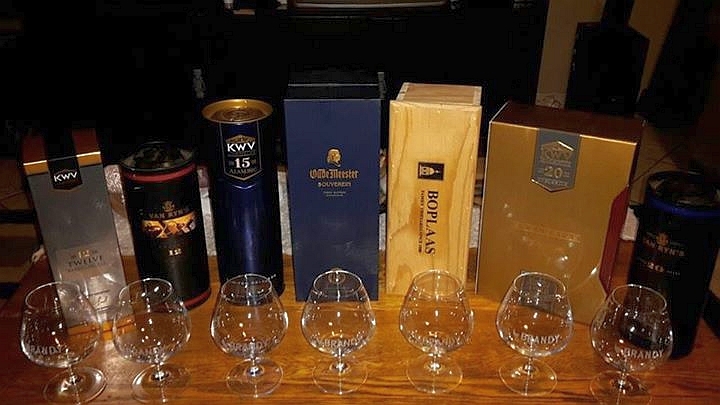 Job well done… Each one of these brandies deserve a tip of the hat from a country that is undeniably the best brandy producer in the world, and you shouldn’t dare to say no to anyone of them! On its first outing this potstill grabbed the World Brandy Award at the IWSC 2014. Rich, robust with caramelized nuts, sun-dried peaches, peardrop on the nose. The palate is that & more. Layers of cashew nut flavour melt in the mouth, honey, dark chocolate & fine sprinkling of spice. A triumph. I will be the first to admit that when initially tasted upon release, I wasn’t overly impressed. I will be the first to admit I was a little surprised when it took 1st place at the IWSC 2014. And I will be the first to admit that this brandy has grown significantly on me. For the price tag it is a steal! Great flavour, awesome nose and enjoyable easy drinking. Perfect with a block of ice. 100% Potstill brandy. Deep colour, with mahogany gleam. Fragrant, delicate aromas of fruit, herbs, flowers lead to full, richly powerful but gentle palate, then a long, sustained finish. Complete, balanced, triumphant. Attractive honey, soft spice & dried fruit with floral backing & some fine oak. Smooth, fine textured & good balance; great complexity from a range of citrus & rich fruitcake flavours. Mellow & mature, with everlasting finish. A fairly recent label & amongst the elite of the Cape’s older potstill brandies – minimum 18 years in oak. Lightish amber colour to yellow rim. Thrilling floral & spice notes, more delicate that Reserve (12YO), even more complex. Not a roughness or jagged edge. Serene, silken, very long. Give this to me any time, any place. Powerful, beautiful and awesome. Great brandy and a great testimony to the South African craft. Gold coloured with a hint of olive green on the rim. Fruitcake, dried apricots, marzipan, sweet prune flavours, mingling with smooth vanilla. Super-complex, elegant & silky palate – both delicate & penetrating – leads to a gorgeous long finish. Just 500 bottles made. My first time tasting this brandy (even though I have owned it for a long time). My built-up expectation wasn’t for nothing and this brandy surpassed any preconceived idea. Unique, intriguing and a must taste. Pleasant change of pace and any connoisseur’s compatriot. Exquisite aromas – sandalwood, apricot, scented flowers, hint of spice & oxidative maturity. Rich & full, yet super-refined & delicate. A touch less forceful that 15YO, but more grace. Beautifully balanced, with supreme oak support. Long, mellow, mature notes carry to slightly sweet finish. Thrilling! Concentrated nose of dark berries, dried fruit& spice. Spice, especially, repeated on the palate along with apricot & prune amidst the complexity. Reminiscences of oak but never intrusive. Mellow, silky & very rich, with forthright finish. My love/hate relationship with this brandy is no secret… Its complexity is comparable with that of a woman’s, but today she loved me back. What an amazingly complex yet fantastic brandy. True craftsmanship and the blessing of time. I am in awe of this tasting you guy’s had, and a little bit jealous as well. Must have been a steep bill to fit, but well worth it. I love the Van Ryn’s 12yo myself, I think it’s a fantastic brandy, But I must agree with the KWV 15yo being the best tasting. You’ve wet my appetite to ensure that I try the other too, and rightfully so, I will. Thanks for article, Love it. Hi Shaun glad you liked it. We sure had fun “writing” it! How spoiled we are for choice in SA, enjoy your brandy! Nice balanced reviews from guys who know their Brandy. All of these can show the way for the category and it is no surprise we are seeing this sector back in strong growth in Nielsen. Very proud of our team ( Pieter and co ) with the 12,15 and 20 !